4711 will launch Green Tea & Bergamot and Coffee Bean & Vetyver, the latest seasonal additions to the brand's Acqua Colonia range. Green Tea & Bergamot ~ "...a calming fragrance, which envelops its wearer in a soft, velvety aura. The energy of the green tea is reminiscent of Oriental tea ceremonies, while the fruity freshness of uplifting Bergamot brings out a deep, inner balance." Coffee Bean & Vetyver ~ "...a stimulating fragrance which teases out vital energy and provides inner strength. [...] In perfect harmony with coffee beans, vetyver, with its elegant, sweetly herbal nuances, has a strengthening and regenerating effect." 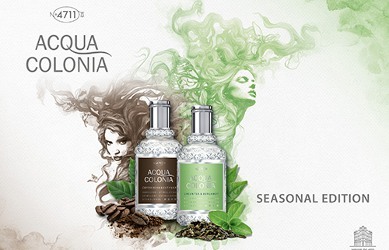 4711 Acqua Colonia Green Tea & Bergamot and Coffee Bean & Vetyver will be available in 50 ml Eau de Cologne. Look for them in October. The Coffee Bean & Vetiver sounds intriguing. Sadly, I have never seen any of the prior Acqua Colonias in stores. If it’s anything like the first 15 minutes of the (long gone) Jo Malone Black Vetyver Cafe, I want a bottle. But I’ll probably never see it either. It may be cheaper to buy them from discounters than driving to a store to sniff! Five point seven ounces of the blood orange one is less than seventeen bucks. Coffee Bean & Vetyver sounds very appealing! Hopefully it will become available some day. I know smallflower.com carries the 4711 brand. I got the lime and nutmeg bath set, and the mini sampler there. Hopefully in October they will have them. OOO thank you! I have bought from smallflower before and was happy with the service. I am sure they will stock these two as soon as they become available. October! I need that Tea and Bergamot in the giant economy size in my refrigerator for easy, cool spritzing right now (Heat Index is currently 104). Dior’s Vetiver, with vetiver and coffee is a fave but I never felt like shelling out for it, this Coffee Bean and Vetyver, could be worth a blind buy. I love Smallflower, I always think “Oh I could never spend enough to qualify for free shipping” But really who am I kidding….lip balms and bath/shower goodies galore. Oh, yes! Coffee bean & vetiver, we need a scent with those notes!